So, today begins our holiday ‘wind down’. We came to Moab as we needed a halfway point on our return trip to Las Vegas. Although this is our third visit to Moab we have still managed to find a couple of places we had never visited before and as usual, have not been disappointed. It has been very hot here today, 95ºF and we think that the mosquitoes must have hatched because they seem to be everywhere! We have decided that we would much rather hike in temperatures of 70ºF rather than the 90’s. Because it’s so hot we cut our day short but we managed to see all we wanted to. We started off visiting Landscape Arch in Arches National Park. The hike is just 1.6 miles, with gradual slopes, but it did seem rather longer than that to us but it was well worth the effort. 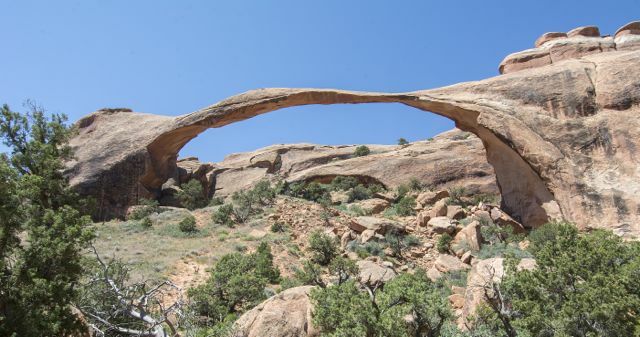 Landscape Arch is the longest of the many natural rock arches located in the Arches National Park. The arch is among many in the area known as Devil’s Garden in the north area of the park. It was named by Frank Beckwith, leader of the Arches National Monument Scientific Expedition, who explored the area in the winter of 1933–1934, and can be reached by short walk/hike of about 1.5 miles along a maintained trail. 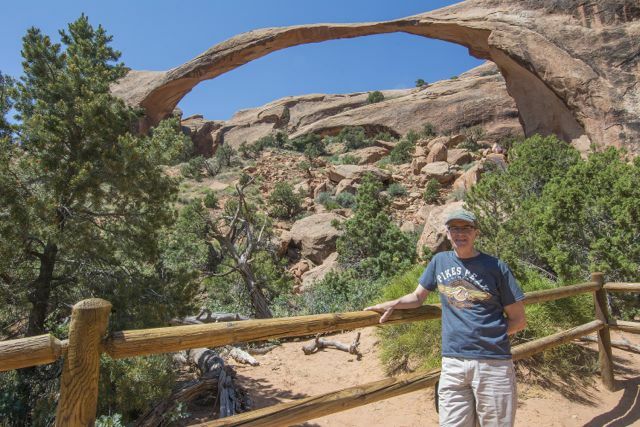 The Natural Arch and Bridge Society (NABS) considers the Landscape Arch to be the longest natural arch in the world, having measured the span in 2004 at 290.1 ± 0.8 feet (88.4 m), which is slightly longer than a measurement made by the Society in 2006 of Kolob Arch in Zion National Park. 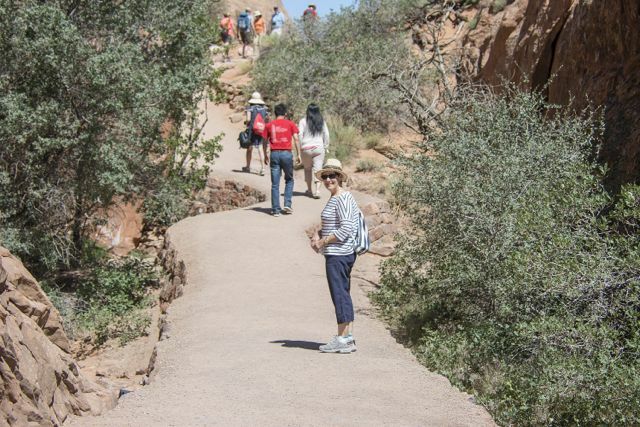 Since 1991, three slabs of sandstone measuring 30, 47, and 70 feet (9.1, 14, and 21 m) long have fallen from the thinnest section of Landscape Arch, prompting the Park Service to close the trail that once passed beneath it. On 1st September 1991 hikers were actually sitting beneath the arch and thought they heard thunder cracks but in fact it was a 60 foot rock slab breaking off above them. When the dust settled 180 tonnes of fresh rock debris lie on the ground. Luckily, no-one was hurt. It is thought that unseasonably heavy rains for ten days before the incident had filled pore spaces within the sandstone and the the added weight may have finally overwhelmed the rock slab in its timeless struggle with gravity. Then, we visited Dead Horse Point State Park (that’s where Si went to last night) so that I could see for myself how beautiful it is. 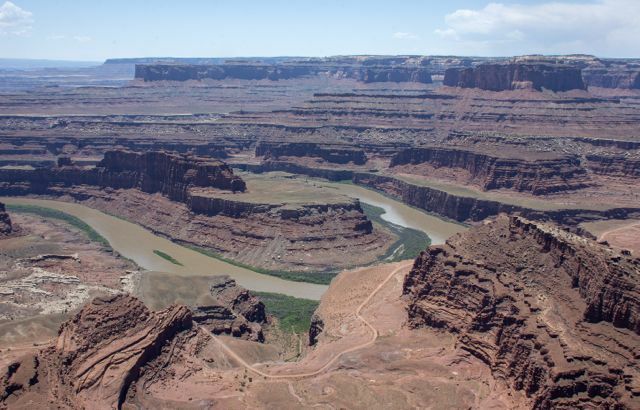 The Park features a dramatic overlook of the Colorado River and Canyonlands National Park. The park is so named because of its use as a natural corral by cowboys in the 19th century. 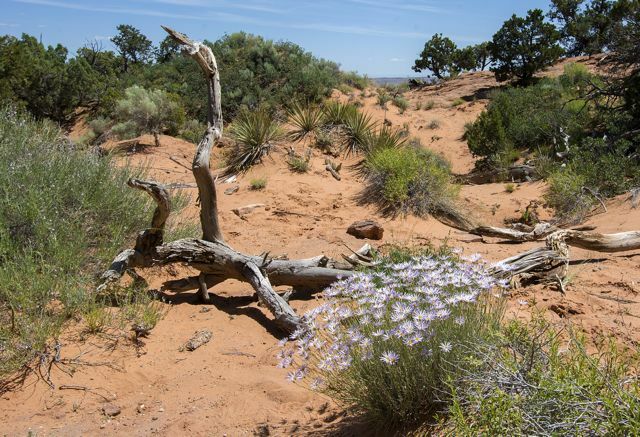 The park covers 5,362 acres (2,170 ha) of high desert at an altitude of 5,900 feet (1,800 m). The plateau is surrounded by sheer cliffs 2,000 feet (610 m) high with only a narrow neck of land 30 yards (27 m) wide connecting the mesa to the main plateau. Thus it was easy for cowboys to simply fence off this narrow neck, and keep rounded up wild horses from running away. 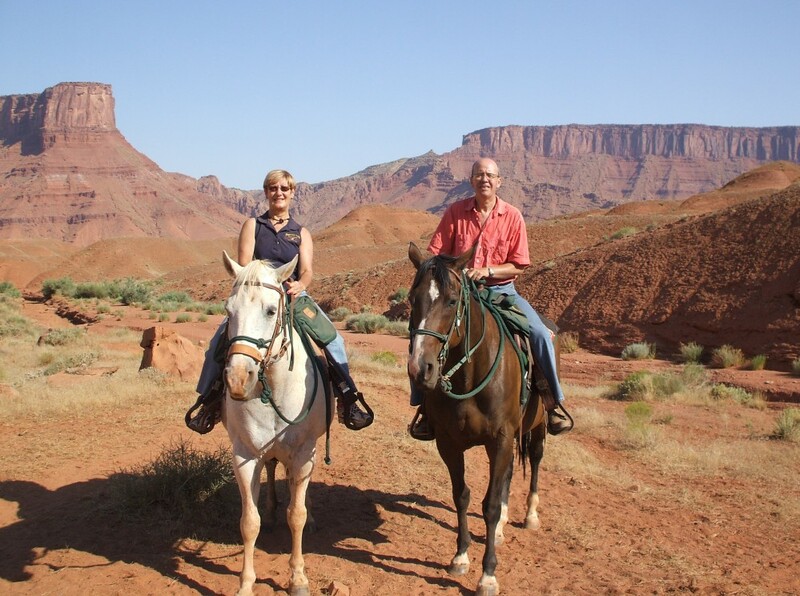 The Legend of Dead Horse Point: There are many stories about how this high promontory of land received its name. According to one legend, around the turn of the century the point was used as a corral for wild mustangs roaming the mesa top. Cowboys rounded up these horses, herded them across the narrow neck of land and onto the point. The neck, which is only 30-yards-wide, was then fenced off with branches and brush. This created a natural corral surrounded by precipitous cliffs straight down on all sides, affording no escape. Cowboys then chose the horses they wanted and let the culls or broomtails go free. One time, for some unknown reason, horses were left corralled on the waterless point where they died of thirst within view of the Colorado River, 2,000 feet below. One useless fact: The area was also used in the final ‘Grand Canyon’ scene of the 1991 film Thelma & Louise. One of the fun things about driving around the parks is looking for faces in the rocks, this is one the ‘photographer’s apprentice’ saw! 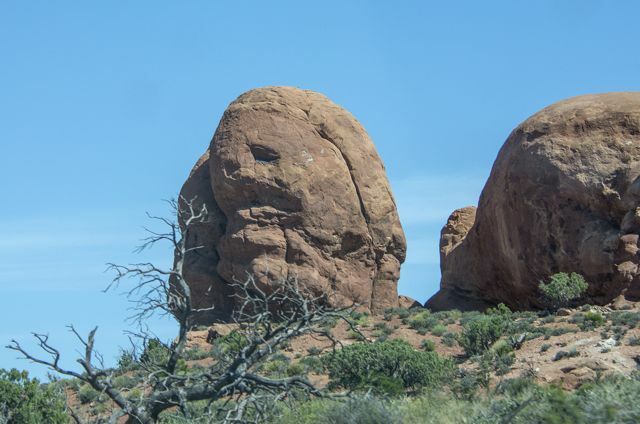 A face in the rock! Tonight we will be dining at Jeffrey’s Steakhouse. We ate there on our trip last year and it was fantastic so we thought what better way to end our visit here than by eating there again. I will once again be sampling the French 75! That’s a very special gin and tonic. Good job I’m writing this blog before dinner!! Tomorrow we leave Moab and have another long drive (we seem to be doing a lot of them lately!) to Las Vegas where we will be spending the last week of our holiday lying in the sun, eating fine food and drinking fine wine!! It occurred to me that in yesterday’s ‘Special Post’ I forgot to tell you what Si’s name is on Flickr, It’s ‘simonsaint’ and also that it might be a good idea to give you a link to his actual Flickr page so you can have a look around if you’d like to. Click here to visit his page. I have run out of adjectives, there are no more left in the O.E.D. Well done with the Flickr contributions, my lovely wife Mary, the non photographer was well aware of the site. Will there now have to be an “advanced class plus” added at the Y.C.C. Answer: as long as there are judges who say “lovely little girl,” to a picture that has clearly been announced as “Vincent.” probably not!!! Don’t go wild on the one armed bandits, the clue’s in the title. Enjoy the shows and travel safe. Thanks Malcolm. It always takes a women to know where to look!Looking forward to the one armed bandits and Si’s looking forward to the Craps tables. The show we were booked to see, some magic job, has been cancelled so we will have to look for something else. And keep your heads down, just hearing on the news, one person shot dead in Las Vegas. Stay away from Pizza Cafés and Wal-mart. Travel safe but stay low!! Thanks Malcolm. Yes, it’s very sad what happened. 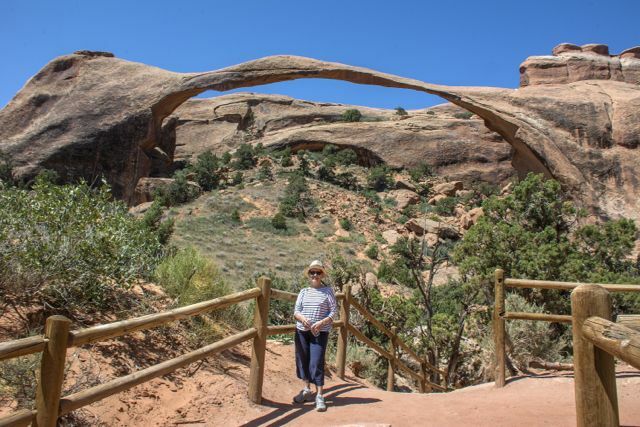 Sandra I love all the photos…you are adorable in your hat in the pics from Landscape Arch! Thank you Nat. I’m not really a hat person but in heat like that it has to be done!